The No. 3 Virginia men’s basketball program couldn’t overcome an onslaught of 3s in Saturday’s 81-71 home loss to Duke. One of the worst 3-point shooting teams in all of college basketball heading into the top 5 matchup, the Blue Devils made 13-of-21 attempts from beyond the arc, including 8-of-11 in the first-half and 5-of-10 in the final 20 minutes. UVA did well to rally and cut the halftime deficit to four but would get no closer. Partly because Duke, which now ranks 285 out of 353 teams in the country in 3-point shooting at 32% according to TeamRankings.com, was able to maintain its surprising effectiveness from beyond the arc. The Blue Devils also came through with clutch baskets – 3-point or otherwise – at the right times, keeping the homestanding Hoos at bay. Another part of Virginia’s inability to make a major second-half surge, though, was turnovers. – With 13:46 remaining, a De’Andre Hunter turnover resulted in a fastbreak dunk by RJ Barrett and a 10-point lead for the Blue Devils. – Ty Jerome’s turnover with 11:28 remaining led to Tre Jones being fouled on a fastbreak. He made both free throws to give Duke another 10-point advantage at 59-49. – Duke’s Zion Williamson scores two after a shot-clock violation by Virginia at the 4:31 mark. The Cavaliers were suddenly down 70-61. Virginia had cut the Duke lead to five at 66-61 on a Hunter 3 a few possessions earlier. Virginia finished with 14 turnovers that led to 17 points – 11 of the fastbreak variety for the Blue Devils, who hurt Virginia with 17 fastbreak points in total. UVA posted similar numbers in a 66-65 overtime road win over NC State two games prior, when the Wolfpack converted 16 Cavalier turnovers into 17 points and had 14 fastbreak points, the latter in particular helping them overcome a 14-point second-half deficit to force overtime. The matchup with Duke was the third straight game in which Virginia had 14 or more turnovers. Sandwiched between the performances versus NC State and Duke was a 14-turnover outing in a 10-point home victory over Miami. The Cavaliers played without Jerome against the Hurricanes, and freshman Kihei Clark had six turnovers in 37 minutes in the win. High turnover numbers are not part of any winning formula, especially Virginia’s, as the Hoos average 63.4 possessions per game, which is second-lowest in Division 1 basketball. SCACCHoops.com credited UVA with 64 possessions against Duke on Saturday. While the Cavaliers are good enough to overcome turning the ball over in the mid-teens against some teams, it’s something that needs to be improved by the time NCAA Tournament time comes around. Provided the Cavaliers are healthy, there is no reason to think they can’t return to their low-turnover ways. After all, Virginia led the nation in lowest turnovers per game prior to Duke (the Hoos are now at 9.2 turnovers per game, tied for second in the country with Michigan per Team Rankings). 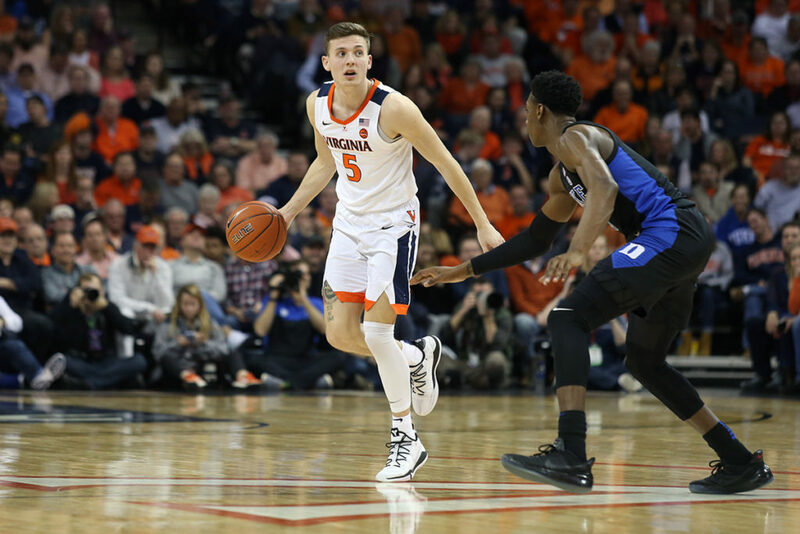 Prior to the last three games UVA went five straight games with single-digit turnovers, including only two in a blowout victory at Notre Dame on January 26. The Cavaliers have two games with two turnovers this season, and both came on the road – the win over the Irish and a win at Maryland. – Mamadi Diakite sat out the entire second-half after butting heads with Hunter late in the first-half. He had scored seven points in 10 minutes of play before the injury. The redshirt junior forward also blocked a shot, extending his streak of games with at least one block to 15. – “Obviously it was a tough way to lose. None of us are happy about it, but we’re not deflated. We’re keeping our heads up. We have to, we have another game coming up, but also like we can win that game. When the time comes we can win.” – Huff on the team’s mindset following the loss to Duke. – “It’s definitely big in that regard.” – Huff said when asked if his performance against Duke served to strengthen his confidence. The 7’1” third-year out of Durham posted 8 points, 2 rebounds, 1 block, and 1 turnover in 13 minutes against the Blue Devils. He added that he was disappointed he missed some shots early and some defensive assignment early but says he is feeling comfortable on the court.